Sowerby Bridge railway station opened in 1840 on part of the line between Normanton and Hebden Bridge. The original station was close to the existing tunnel mouth alongside the present Tesco car park. Brighouse railway station also opened at the same time. The crowds were so big that the person in charge at Brighouse ordered out an open wagon in which those on the top of carriages found accommodation only for it to be left behind when the train set off. Sowerby Bridge Station: Railmotor no. 8 with coach no. 13. This platform was put in at Sowerby Bridge for the start of the railmotors to avoid the trains having to back out of the station then move forward onto the branch. Originally the Rishworth Branch was thought of in 1845 leaving Sowerby Bridge station at a junction facing Manchester and going only to Ripponden. This came to nothing and the idea was revisited in 1864 with the new line commencing at Sowerby Bridge and the junction facing Leeds. In the Parliamentary proceedings associated with the Bill it was mentioned that there were 36 mills in the valley paying at that time between 2s. 4d and 3s per ton to transport coal from Sowerby Bridge, and the railway would reduce this to 2d or 3d per ton. There were three noted objectors to the line, these being Messrs W.H. and F.E. Rawson and Mr R. Ridehalgh. Their major concern was expressed in engineering terms about the junction with the main line at Sowerby Bridge, although comment was made about the route through the valley, even to the point of suggesting a route up the other side be looked at. 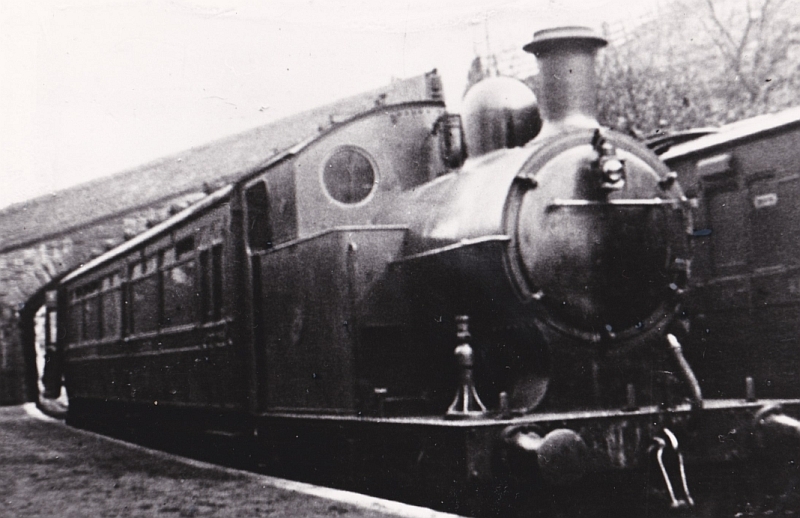 2-4-2T in reverse with two coaches approaching Watson Crossing. This formation was used when the usual railmotor was not available. In spite of this, however, Royal Assent was finally given to the Railway Bill on the 5th July 1865. This Bill was only to Ripponden though and approval of the extension to Rishworth came in 1870 in the Lancashire and Yorkshire Railway Act of that year. 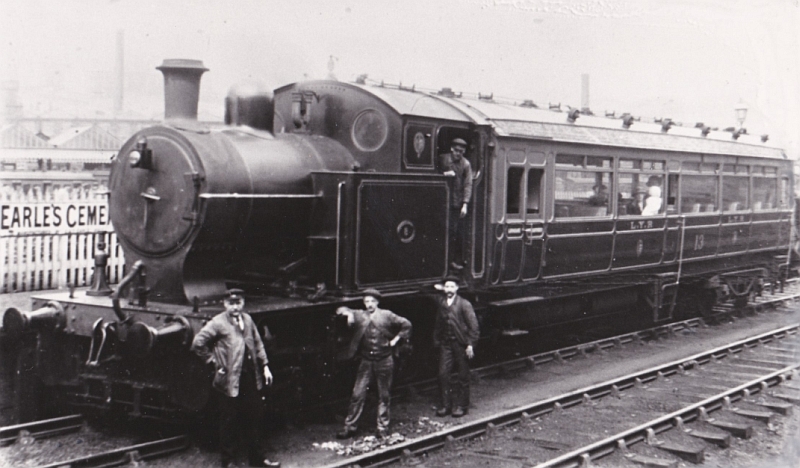 Work did not commence on the railway until 30th September 1873 and it was to take another five years before it opened initially as far as Ripponden. Here it opened for goods traffic on the 15th July 1878 and finally for passengers on the 5th August 1878. This was a total of thirteen years since the initial Bill received Royal Assent in 1865. A day of great celebration was enjoyed by the people of Ripponden, including the firing of two cannon at various intervals throughout the day. Triangle Station: Railmotor en route for Rishworth with coaches in storage on the other line. The extension to Rishworth (Slitheroe) was not to open for a further three years, in 1881, although it would appear from newspaper comments in 1878 that it was largely in place at that time. Access to the station was, however, gained by passengers and road vehicles along a trestle bridge and it may have been that this was incomplete. The opening for both goods and passengers took place on 1st March 1881. The level of celebration was not quite as intense as with the original opening at Ripponden but nevertheless it appears to have been quite a day. It is worth noting that Rishworth was the smallest of the Lancashire and Yorkshire branch termini in Yorkshire. 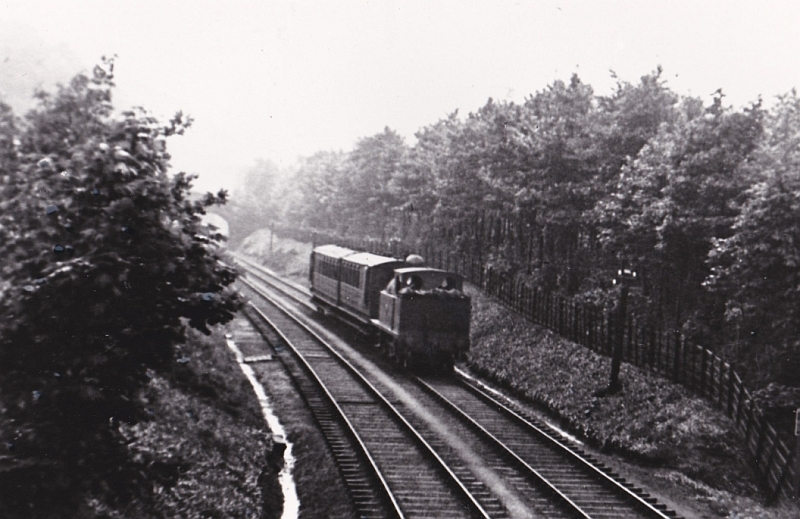 The Rishworth Branch was constructed to mainline standards and double track throughout as it was intended to extend the line to near Smithy Bridge in Lancashire thereby cutting the journey from Leeds to Manchester by about 5 miles. This proposal was, however, aborted but in some quarters it was felt that the decision not to proceed with this was one of the most regrettable in the history of the Lancashire and Yorkshire Railway. Ripponden and Barkisland Station. 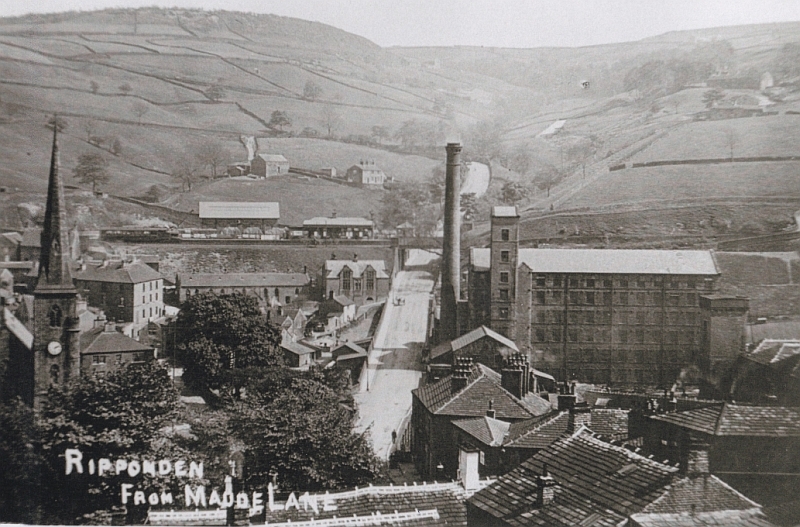 Taken from Maude Lane, Ripponden with the bridge over Elland Road/Ripponden Bank clearly visible. More picking up and setting down points. Better connections with main line trains. 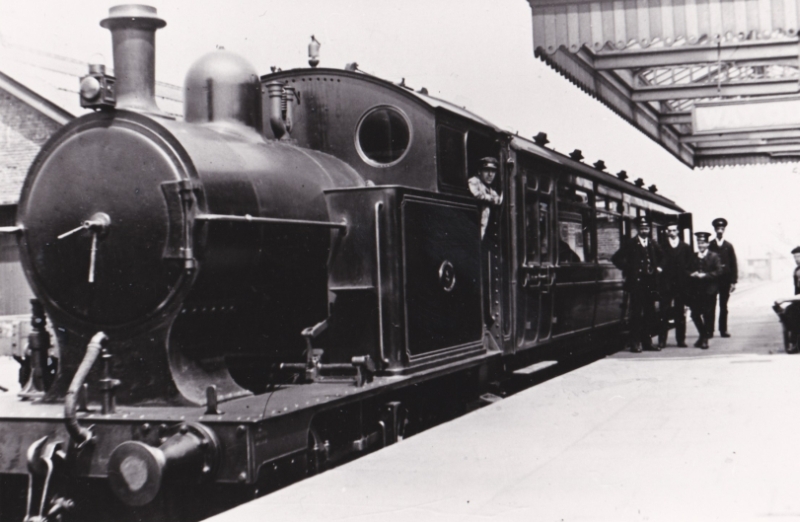 The introduction of motor trains was not entirely successful though as the service closed to passengers on Saturday 6th July 1929, with Ripponden and Rishworth being retained for goods traffic. Such traffic continued to Rishworth for a further 23 years before the site closed completely in March 1952, the reason cited being that the trestle bridge, over which both passengers and road vehicles got access to the station, was giving cause for concern. The route to Ripponden continued for a further 6 years, it closing completely on 1st September 1958. By 1962 the track had been removed and the tunnel entrances bricked up bringing to an end the railway up the Ryburn Valley.